Close Purchase Order – Can close a purchase order to purchase history. Edit Purchase Tax Flags – Allow user to change the default taxes that were added from the vendor. Issue Purchase Orders – Can issue and send PO to vendor. Receive Purchase Orders – Can receive a PO to inventory. Un-issue Purchase Orders – Can un-issue an issued or received PO. 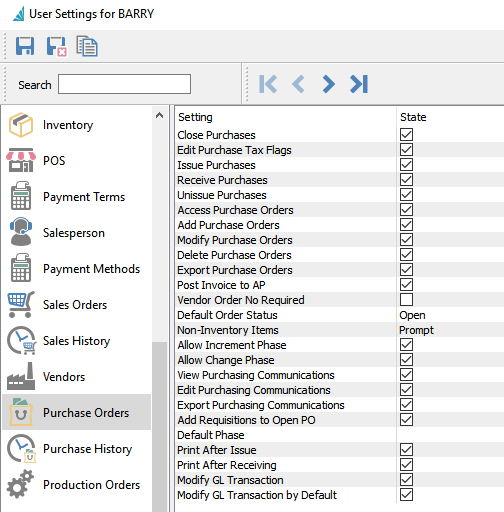 Access Purchase Orders – Can get into POs and the PO module will be on the main menu. Delete Purchase Order – Allow user to delete an unissued or non received PO. Post Invoice to AP – User will be prompted to create an invoice to accounts payable. Vendor Order No Required – Requires the user to enter a vendor order number before saving the PO. Allow increment phase – User can move a PO to the next phase by clicking the button in the PO or on the PO list. Allow change Phase – User can edit the phase that a PO is currently in. View Purchasing Communications – Can view the PO Communications. Edit Purchasing Communications – Can edit PO Communications. Export Purchasing Communications – Can export PO Communications. Default Phase – The default phase that a PO gets set to for the user.